Br. Curtis Almquist suggests why and how to prepare our hearts for the Sacrament of Reconciliation. In our relationship with God we are always respondIng. God is wooing us, luring us, loving us into a more beloved relationship. How God will break through to us will oftentimes be through something that is broken within us. Our break will be God’s “break,” God’s breakthrough, God’s point of entry into our lives. Any awareness of a need to confess our sin is already an act of preparation, God’s preparatory work in our souls. If you are sensing a need to make a confession of sin – and the fact that you are reading this suggests that, perhaps, you are – then trust that this is already a response to God’s initiative, and that is good news. God’s invitation is for you to be reconciled to God, to your own self, and to others. The Sacrament of Reconciliation is a powerful means of grace available to you. In the Anglican tradition, this is not a mandated sacrament. You have every liberty, in the privacy of your own heart and in your own words, to confess your sins in prayer directly to Jesus. In the scriptures we read, “For there is one God; there is also one mediator between God and humankind, Christ Jesus, himself human, who gave himself a ransom for all” (1 Tim 2:5-6). And from John’s first letter: “If we confess our sins, he who is faithful and just will forgive us our sins and cleanse us from all unrighteousness” (1 Jn 1:9). Another opportunity for the confession of sin in our tradition comes in the corporate confession of sin included in most liturgies. The Book of Common Prayer provides language for you to express aloud your awareness of sin “in thought, word, and deed, by what [you] have done, and by what [you] have left undone.”(1) With the authority Jesus gives to the Church, the priest responds to the corporate confession of sin with words proclaiming God’s forgiveness. Availing yourself of these personal and corporate practices, you may have every assurance you need of God’s forgiveness. As Anglicans, we say of the Sacrament of Reconciliation, “all may, none must, some should.” And you will know when you should. Either at a particular point in time or on a regular basis, you may need the help of this sacrament. You may be at a point of crisis, aware of some egregious breakdown on your part, or rather burdened by a tedious, repetitive sin. Either way, if left alone, you may conclude you are both unforgiven and unforgivable. You may need a very personal and powerful intervention of the grace available in the Sacrament of Reconciliation. You may need certainty – certainty that Jesus has both heard your confession and assured you of his forgiveness. That will happen: “The sacraments are outward and visible signs of inward and ￼ spiritual grace, given by Christ as sure and certain means by which we receive that grace.”(2) You may need this very explicit assurance of your forgiveness, of your being liberated from an internal prison of condemnation. How God will break through to us will oftentimes be through something that is broken within us. And you do know it. You do. Confession is born from a conscious awareness of a breakdown: You either momentarily or methodically have “slipped” in what you know full-well to be right – right by you and by others – and have compromised your integrity. Or perhaps you may realize your lapse only in the sobriety of retrospect. You may have no answer to your own haunting question, “Why did I do that?” “Why did I say that?” Saint Paul makes quite a humbling confession: “I do not understand my own actions. For I do not do what I want, but I do the very thing I hate” (Rom 7:15). Oftentimes a wrong we have committed was the surfacing of some deeper character flaw or inner wound, perhaps an infected wound. Jesus calls these the sins of the heart: “fornication, theft, murder, adultery, avarice, wickedness, deceit, licentiousness, envy, slander, pride, folly” (Mk 7:21-2). Sin is an experience and exercise of alienation – an alienation from our own true self, from others, and from God. A breakdown in relationship in one of these realms (to self, to others, to God, to the Creation) will affect the other. Sin goes viral. We need to be rescued by a power greater than ourselves. Should you be burdened by a sin that springs from wrongs done to you, perhaps the Sacrament of Reconciliation can offer some much-needed help for your soul. Confession becomes a way that we can unlock those prisons that may have been built before we can even remember. Turning ourselves over to the healing power of Jesus, we break the long-ingrained patterns that have bound us. When I meet with someone to hear their confession, I always have at hand healing oil – the Sacrament of Holy Unction – because this person seeking God’s forgiveness (what the Scriptures call “unbinding”) may also need inner healing (what the Scriptures call “binding up”) from the root causes of their sin. Jesus has come to save us, to salve us, and to salvage us. Jesus has come “to seek and to save the lost”: lost hope, lost love, lost joy, lost innocence (Lk 9:10). To salvage is to reclaim what is otherwise lost and to see it made into a new and beautiful thing. This is what Jesus is up to. Even the most appalling ravages of life can be redeemed in the most amazing ways. In the Sacrament of Reconciliation, one of the experiences of grace will come through the priest’s helping the penitent sift and sort through sin: What is your own sin? What is the sin against you which you carry and perhaps replicate? What of your broken life needs to be retrieved, reclaimed, redeemed through Jesus’ intervention? 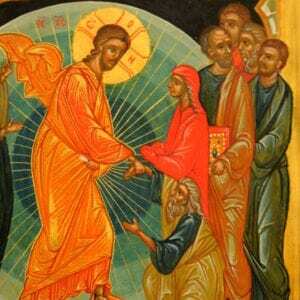 Jesus tells his disciples, “Gather up the fragments left over, so that nothing may be lost” (Jn 6:12). Hear this as a personal promise from Jesus to you, about your own life. Nothing is to be lost. Even the most appalling ravages of life can be redeemed in the most amazing ways. • If the confession is prompted by some specific awareness of sin that weighs on your conscience, then allow your reflections to focus on this particular sin and others that might be connected to it. • If you make a confession on a regular basis (perhaps quarterly) as a spiritual discipline, then allow your reflections to revisit the topics and gleanings that have arisen in past confessions. Whether you are making a review of a lifetime, or reviewing only this past season of your life, note where your soul is troubled. • Do you have memories that sear your conscience, be they of particular incidents or a chain of events that set off a kind of a tsunami of sin in some aspect of your life? • Is there a recurring, damaging pattern of behavior? • Do you have a residual experience of self-loathing or shame? Why is that? In asking these questions, you are not “digging for dirt”; you are simply uncovering what is soiled in your soul, what you no longer have energy to conceal. The energy it takes to conceal our sin (even from ourselves) is like keeping a part of ourselves locked up in prison, where we are both the prisoner and the prison guard. You need to be able to live your whole life. (In English, the words “whole,” “holy,” and “health” all come from the same etymological root.) When Jesus begins his public ministry, he quotes the prophet Isaiah in claiming his anointed role “to bring good news to the poor... to proclaim release to the captives... to let the oppressed go free.”(6) Jesus’ forgiveness is liberation, quite literally a lightening of the weight of sin, and the opening of the door to the abundant life he promises. The energy it takes to conceal our sin (even from ourselves) is like keeping a part of ourselves locked up in prison, where we are both the prisoner and the prison guard. • Begin your time(s) of recollection with a prayer of thanksgiving that God’s reconciling love has already broken through to you. God is already with you in this. Wash me through and through from my wickedness and cleanse me from my sin. • Then ask God to open the eyes of your heart for the clarity and courage to remember what weighs on your conscience, what you long to be forgiven. • If you knowingly (or unwittingly) brought a “whip” into this time of recollection, you need to hand that over to God. Give it up. Reconciliation is not about heaping up blame, but about releasing yourself from its burden. • At the conclusion of your time(s) of recollection, offer a prayer of thanks that God is inviting you into personal freedom, and into a more intimate relationship with God. Reconciliation is not about heaping up blame, but about releasing yourself from its burden. To prompt and clarify your recollection, you may find it helpful to use one of the following sets of focusing points as you examine your conscience. To love and obey God, and to bring others to know God. To put nothing in the place of God. To show God respect in thought, word, and deed. To set aside regular times for worship, prayer, and the study of God’s ways. To love, honor, and help my parents and family; to honor those in authority, and to meet their just demands. To show respect for the life God has given; to work and pray for peace; to bear no malice, prejudice, or hatred in my heart; to be kind to all the creatures of God. To use all my bodily desires as God intended. To be honest and fair in my dealings; to seek justice, freedom, and the necessities of life for all people; to use my talents and possessions as one who must answer for them to God. To speak the truth, and not to mislead others by my silence. To resist temptations to envy, greed, and jealousy; to rejoice in other people’s gifts and graces; and to do my duty for the love of God, who has called me into fellowship with God. If this is your first confession, or a “life” confession, you may feel unfocused or overwhelmed in knowing where to begin a review of your entire life. If so, you may find it helpful to demarcate your life history into quadrants, and then use one of the above sets of focusing points as you examine each quadrant. Make notes. You will most likely find it helpful to record what has come to mind as you prepare for your confession. You may be nervous when you make your confession and you won’t want to trust only your memory. If you make notes, don’t use a journal where you save your personal writing. Once you have made your confession, you will want to destroy your notes. They reflect a part of your history from which you have been freed. The end. Finally, as part of your preparation, review what The Book of Common Prayer says about the Sacrament of Reconciliation (446), and read through the two suggested Forms (Form One, 447-8; Form Two, 449-51). The two Forms are equivalent; however you may find the language of one more inviting. When you meet with your confessor, tell him or her your preference. Once you have made your confession, you will want to destroy your notes. They reflect a part of your history from which you have been freed. The end. In your confession, you will want the freedom to be transparent. 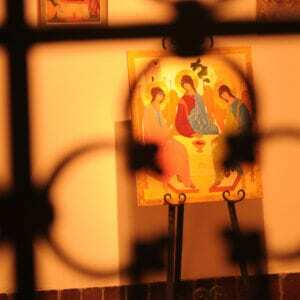 Choose a confessor whom you sense to be trustable. Your parish priest may not be the best choice, not because of his or her character or experience, but because of your existing relationships with both the priest and other parishioners. Your confession could put an invisible strain on those relationships. If you don’t have access to a priest outside your parish, you might ask your priest if he or she has a recommendation for an “outside” confessor. The priest who hears your confession will “seal” what you speak forever. “The secrecy of a confession is morally absolute for the confessor, and must under no circumstances be broken.” (9) Even if you are alone with this priest at some point in the future, the content of your confession will not normally be a matter of subsequent conversation. A confession may be heard anytime and anywhere. (I have heard confessions at the altar rail, in a private conference room, in a crowded gymnasium, on an airplane, on a hiking trail in the mountains...) The confessor and the timing may determine the setting. You may want to sit for the entire confession; you may want to sit for your confession and kneel for the absolution; you may want to kneel throughout. Carry a handkerchief with you. A condition for receiving absolution is your contrition. The English word “contrition” comes from the Latin contritus, literally “worn out” or “crushed in spirit” by a sense of sin. You come to confession not as a legalistic duty but out of abject need to be saved, and salved, and salvaged. Implied in your contrition is your pledge for amendment of life. You do desire to change, and you are seeking (maybe desperately) God’s help. The priest will offer words of comfort and counsel and will pray for the absolution of your sins. The confessor may also give you a “penance.” A penance is not a condition for your forgiveness. Forgiveness is already guaranteed. A penance may simply help you grasp and appropriate the forgiveness you have already received. For a penance, the confessor may suggest, for example, that you recite the Song of Symeon, the Te Deum, the Magnificat, or a psalm. (10) I sometimes will counsel a penitent to be patient and gentle with themselves, to allow the healing to happen: “Don’t pick at the scab.” I sometimes encourage a penitent to take in something beautiful – fresh flowers, music, artwork, a soothing cup of tea. Saint Paul writes, “So if anyone is in Christ, there is a new creation: everything old has passed away; see, everything has become new! All this is from God, who reconciled us to himself through Christ, and has given us the ministry of reconciliation” (2 Cor 5:17-8). The Sacrament of Reconciliation is a very powerful doorway into this discovery: recovering, restoring, renewing life in the most amazing way. The Book of Common Prayer (BCP), 360. From the “Catechism,” BCP 857. The language of Step 4 from the 12-Step program. Luke 4:18-9; Jesus quoting Isaiah 61. The Song of Symeon (BCP, 93); The Te Deum (BCP, 95); The Magnificat (BCP, 119); Psalms 63, 103, or 139. Br. Curtis Almquist, SSJE resides at Emery House, sharing in the daily round of prayer and worship, meeting with retreatants, stewarding the beautiful grounds, and doing some baking and cooking. He is an avid photographer and swimmer. He came to SSJE almost 25 years ago and served as Superior from 2001 to 2010. I do believe in the sacrament of Reconciliation my non catholic friends contend that you should confess to your brothers. I understand where they are coming from but the only question I ask when I’m told that is. When is the last time you or anyone in your Church has done that or what is the mechanism to have this done. In the Catholic Church we have the Sacrament of Reconciliation. The only thing is I don’t believe that God forgives my sin at the moment of confession. I believe God has already forgiven us, but it is us who has turned away from God in sin. We repent and turn back toward God. I believe that like “the sacrament of reconciliation was made for man not man for the sacrament of reconciliation. I also feel there should be more, we turn back to God by going to Confession, but does this always convince us the confessor that we are worthy of Christ. I believe in confession but I also think we need to share with someone who has been down the same path. Like the 4th & 5th steps of Alcoholics Anonymous we take inventory of what we have done wrong, but also what good I have done then tell someone who has gone down the same path. From this we get we are not alone in our sins we are not a freak of nature “For all have fallen short of the Glory of God”. In this the Holy Spirit convicts us then we repent we process it and move on. instead of not dealing with our wrongs because of the accuser(Satan). I was so glad to find this on Web site. I use the sacrament of reconciliation twice a year. In preparing for this I could not find the book I use in guiding me. This article was truly a godsend. I thank the author for writing on reconciliation.